Last night whilst browsing around I came across a blog by a guy called Ryan in the US who had been diagnosed with Stage IV Hodgkin's Lymphoma. 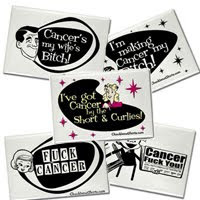 He's also set up an online shop to sell cancer related items. We appear to have nothing like this in the UK (well, not that I can find anyway) and I'm putting the link here to his online shop simply because I think his attitude and his stuff are both great. Also, he DOES ship to the UK and worldwide for very reasonable rates. On his website, you'll also find other goodies like Sweatshirts, T Shirts, bags AND there's money saving special offers there at the moment. Yes I did get your last message and left you a reply. If you go back to the post 'Nice Day just Chatting' you'll find it there. Lovely to hear from you again Barbara, Lou does keep me up to date with what's happening with you and the children and it's all sounding good. Thank you for your thoughts and prayers...all being well it'll all be done and out of the way soon. Great Products to get the message out for sure. If you don't have someone close to you that has been or is going through cancer, its easy to forget that "anyone of us" is open to this illness. I'm running race for life in Rhodes, Greece on 10th October, its their first ever race and there are many free open conferences going on in hotels here at the moment for residents and tourists. If an island with only 100,000 people can promote this illness, more needs to be done in the UK. I think these products will be a winner with our English humour. Well done Ryan. Nice one Carole...I will defo give it a go! I particularly love the cards...they fit my sense of humour completely. I googled here in the UK for 'Cancer cards' and found nothing...seems we are still tiptoeing around 'cancer' and scared to upset anyone. 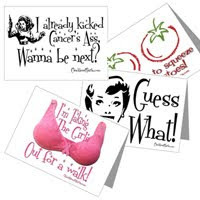 I'm going to do a 'piece' on your Greek Race for Life...can you make sure that M takes photo's during the event please. Tell him it's ESSENTIAL! 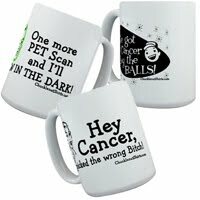 Oh how fabulous it would be if there were a few of those mugs, cards and t-shirts scattered around the cancer hospitals we have to visit instead of being faced with all those walls of scary leaflets! Wouldn't it be great if you were in the waiting room and looked up to see a huge poster saying F**K cancer, instead of that stupid sneezing swine flu man saying catch it, bin it, kill it. Lots of positive thoughts coming your way this week, Carole. PS I put the Blurb info on the CR forum on the blog thread. Couldn't get the links to work, but hopefully your friend will be able to follow the instructions! Yeah whatever! F**k Cancer posters are needed I say! Paula's on your followers list and I've sent her a message to tell her you've done a post about the book. That's great because now she can SEE what she can do with her blog too.